The Monster Monster Notebook Stand provides a cool way for people to prop up their laptops. The design is unique and offers improved ergonomics to computer users. The notebook stand was created to fit a 15 inch, 16 inch, or 17 inch laptop. However, there is a 14-inch version that should be available soon. Each Monster Monster stand is handcrafted from acrylic. The stands also have rubber feet to protect a person’s desk from any scratches. It’s a unique stand that is edgy and has plenty of functionality. In addition to offering better ergonomics, the Monster Monster notebook stand also provides a way for an individual to cool off their laptop. The stand is tilted an angle that will reduce overheating. Fortunately, the notebook stand will ship worldwide. When the stand arrives in the mail, it does require assembly but it should only take a few seconds to assemble the stand. The standard comes in two colors – red or white. Individuals can expect to pay about $30 for the Monster Monster Notebook Stand. 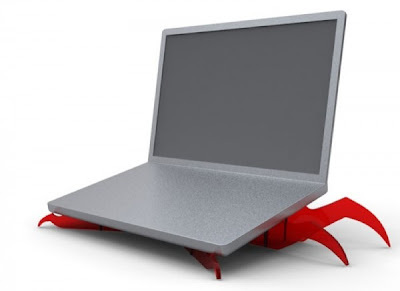 It’s the perfect notebook stand for people who want to prop their laptops up on an arachnoids’ pedestal.